A top Indian minister said strikes targeted a training camp of the Jaish-e-Mohammad (JeM) group in Balakot. Pakistan said it scrambled fighter planes in response. The move represents an escalation of hostilities between the two nuclear-armed neighbours. It is the first air strike launched across the line of control, the border that divides India-administered Kashmir from Pakistan-administered Kashmir - since a war between the two countries in 1971. 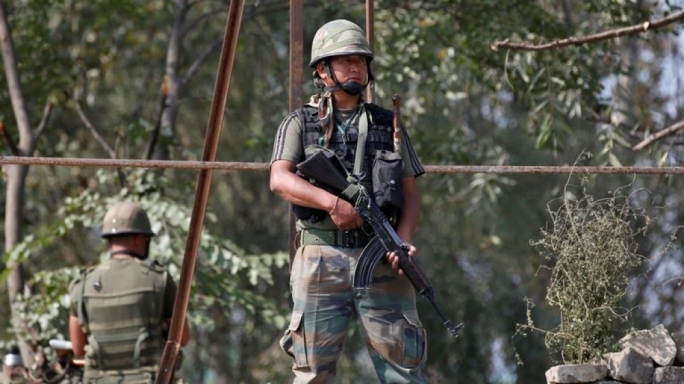 Indian Foreign Secretary Vijay Gokhale told a news conference that the strikes had killed a "large number" of militants, including commanders, and had avoided civilian casualties. "Credible intel [intelligence] was received that JeM was planning more suicide attacks in India. In the face of imminent danger, a pre-emptive strike became necessary," he said. The latest incident follows the suicide attack on an Indian security convoy in Pulwama, in Indian-administered Kashmir, earlier this month. Pakistan's military confirmed that Indian jets flew over its territory but said they caused no damage. Spokesman Major General Asif Ghafoor tweeted: "Indian Air Force violated Line of Control. Pakistan Air Force immediately scrambled. Indian aircrafts gone back. Details to follow." Indian aircraft "released [a] payload in haste... near Balakot", he added. On 14 February, 46 Indian paramilitary police were killed in a militant operation there. It was the deadliest attack on Indian forces in Kashmir for decades. The assault was claimed by Pakistan-based JeM and prompted a spike in tensions between nuclear-armed India and Pakistan. Pakistan denied involvement, while India said its neighbour had had a "direct hand" in the attack and accused it of providing sanctuary to the militants. Both India and Pakistan claim all of Muslim-majority Kashmir but control only parts of it. The nations have fought three wars and a limited conflict since independence from Britain in 1947 - and all but one were over Kashmir. Pakistan's Prime Minister Imran Khan said on Sunday his Indian counterpart Narendra Modi should "give peace a chance". He added that if India provided "actionable intelligence" regarding the Pulwama attack that proved Pakistani involvement, "we will immediately act". On Saturday, Modi had called on Khan to join India in fighting poverty and illiteracy, instead of the pair fighting each other.